Designed to fit inside a 90cm kitchen cavity. A 605L frost free French door refrigerator with water dispenser, automatic ice maker. Clever engineering allows it to be installed with minimum gaps on the sides meaning maximum storage for all your fresh produce. There is nothing more refreshing than freshly crushed ice in your drinks. Now it's always available with your fast ice maker. With fast ice production, you'll enjoy cubed or crushed ice from the handy dispenser whenever you need it. The Westinghouse French Door Fridge with ice and water helps keep your family healthy and hydrated. With easy access to chilled, filtered water from the slimline in-door water dispenser, no one will need to go thirsty again. Not every grocery shop is the same. Sometimes you need extra room for things like celery, while other times you need equal space for your fruit and vegetables. That's where the adjustable crisper divider comes in. Created to provide greater flexibility, it can be adjusted lengthwise to give you the space you need. 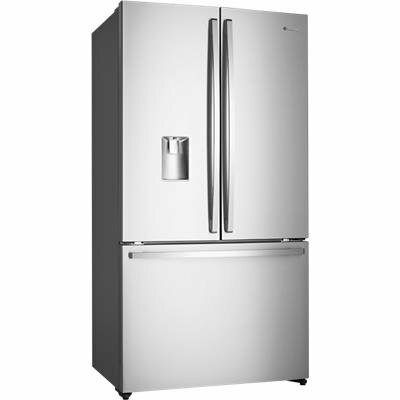 The Westinghouse WHE6060SA Refrigerator was added to the Refrigerators category in August 2017. The lowest price GetPrice has found for the Westinghouse WHE6060SA Refrigerator in Australia is $2,065.00 from Billy Guyatts. Other merchants who stock it are Billy Guyatts, Appliances Online, Bing Lee, David Jones , ozappliances.com.au.